Please leave your details below to subscribe to our newsletter. 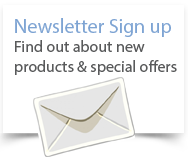 We will then keep you informed of any new products or special offers on the site. We will not share your details with any third parties, see our terms & conditions for more details.